The primary goal of the Swedish massage technique is to relax the entire body. This is accomplished by rubbing the muscles with long gliding strokes in the direction of blood returning to the heart. But Swedish massage therapy goes beyond relaxation. Swedish massage is exceptionally beneficial for increasing the level of oxygen in the blood, decreasing muscle toxins, improving circulation and flexibility while easing tension. Deep Tissue massages use similar strokes to the Swedish massage but pressures are longer, firmer and focus on areas of pain and tension. The therapist manipulates muscles that are below the surface of the top muscles and the connective tissues. “Against grain” strokes are used to break fiber adhesion, oxygenize the muscles and get rid of toxins. Hot stone massage is a specialty massage where the therapist uses smooth, heated stones as an extension of their own hands, or by placing them on the body. The heat can deeply relax tight muscles so the therapist can work more deeply. Main effects: Ease muscular stiffness; Improve the blood circulation and metabolism; Relieve the pain; Reduce the anxiety and stress; Improve the flexibility of the joints; Smooth lymphatic system, promote detoxification and improve the effect of weight-loss. The human head is control center to all body’s major sensory organs. The main part of head is brain that maintains ears, nose, eyes and mouth to function properly. Massage therapy offers lots of benefits to humans who are suffered from trigeminal neuralgia, teeth-ache, tinnitus, earache, insomnia, depression, headache and pain caused by trauma. Even a single massage will make a difference. According to clinical study that headache, dizziness, ringing in ears, blurred vision, hypertension, insomnia and feeling heaviness of head are associated with cervical spondylopathy. The best treatment for cervical spondylopaty is massage. By choosing different acupressure points along with proper pressure force to help you to restore health and reduce the risk of neck illness. 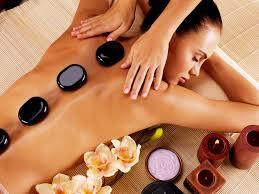 Full body massage offers multiple benefits. It helps you to reduce pain and fatigue; relieve stress from long excess computer work; relax muscle from tightness; it also helps you to improve your flexibility after surgery and thinking ability, such as memory and creativity. Massage therapy during pregnancy is one of the best choices for prenatal care. It is safe for both mom and babe. Massage relieves a lot of discomforts and stress during the pregnancy, such as backache, edema, and leg cramps. It helps to enhance metabolism and improve overall well-being. At Celebrity Spa we’ve seen massage therapy help with shoulder pain, rotator cuff injuries, TMJ, plantar fasciitis, tendonitis, knee pain, whiplash, headaches, neck pain, hip pain, arthritis and many other conditions. We believe that massage is not just about feeling better in the short term, but actually getting better, and staying better. Based on the ancient Oriental meridians, this popular foot massage accesses “reflex” points on your feet that connect to every part of the body. By pressing the points on your feet, tension and stress will melt away from your entire body.